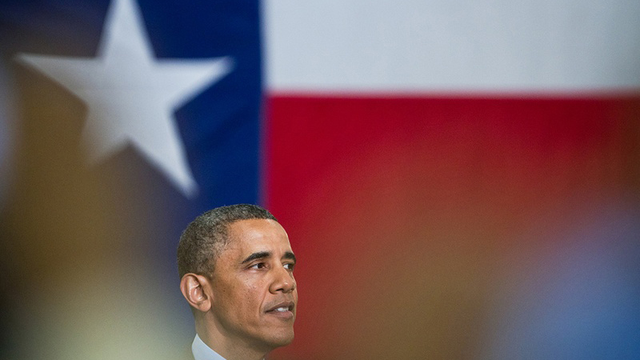 President Barack Obama speaking in Austin on Thursday, May 9, 2013. Gov. Greg Abbott hailed a federal judge's decision Monday to halt President Obama’s executive action on immigration — a decision that gave the state of Texas an initial victory in its battle against what state leaders call federal overreach. U.S. District Judge Andrew Hanen ruled that the Obama administration did not "comply with the Administrative Procedure Act." The policy seeks to give as many as 5 million undocumented immigrants — including some 1.46 million in Texas, a work permit and temporary relief from deportation. Abbott, the state's former attorney general, filed the lawsuit in December before being sworn in as governor. Texas is part of a 26-state coalition that challenged the executive action, which was announced in November. Abbott accused the president of violating several provisions of the U.S. Constitution, including one that gives Congress jurisdiction over immigration laws. Abbott also argued that Texas would be irreparably harmed by the action. He cited as proof last summer’s surge of undocumented immigrants from Central America who entered Texas illegally through the Rio Grande Valley. "President Obama abdicated his responsibility to uphold the United States Constitution when he attempted to circumvent the laws passed by Congress via executive fiat," Abbott said in a statement, "and Judge Hanen’s decision rightly stops the President’s overreach in its tracks." Before the ruling was announced, David Leopold, a past president of the American Immigration Lawyers Association, said he expected the Obama administration to make an emergency appeal to the U.S. Fifth Circuit Court of Appeals if Hanen did not rule in its favor. The federal government would also probably ask Hanen to stay his own order while the higher courts decide the case, Leopold added. He had said that such a decision from Hanen wasn't necessarily the death knell for the executive action. "He’s not the last word," Leopold said. "That is going to come from a much higher court whether it's the Fifth Circuit Court of Appeals or the U.S. Supreme Court." Leopold said he expected that the litigation would slow enrollment, even if a higher court makes the ultimate decision. He added that scrutiny of the program might reduce the number of participants. "I think [the plaintiffs] know they can’t win this case. I think what they’re trying to do is very cynically, throw pizza at the wall and see what sticks," he said.